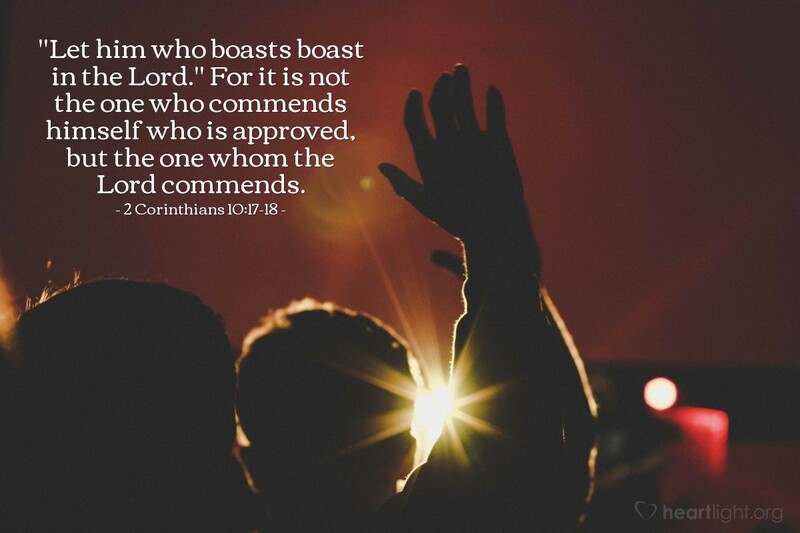 "Let him who boasts boast in the Lord." For it is not the one who commends himself who is approved, but the one whom the Lord commends. हम एक दुनिया में रहते हैं जिसमें तिरछे मूल्य, झूठे वादे और बेड़े की प्रसिद्धि है। भगवान के प्यार की दृढ़ता, भगवान की कृपा की अविश्वसनीय धन, भगवान के आशीर्वाद की अतुलनीय आपूर्ति, भगवान के लोगों की मिठास, हमारे उद्धार के लिए भगवान की योजना की दया, के अलावा हम क्या दावा कर सकते हैं भगवान का कल, ..... भगवान और उसकी अनन्त कृपा से क्या अन्य अर्थपूर्ण घमंड है? We live in a world with skewed values, false promises and fleeting fame. What can we boast in other than the steadfastness of the Lord's love, the incredible riches of the Lord's grace, the incomparable supply of the Lord's blessings, the sweetness of the Lord's people, the mercy of the Lord's plan for our salvation, the promise of the Lord's tomorrow, the.....? What other meaningful boast is there than the Lord and his eternal grace? महिमा और दया के भगवान, मेरे जीवन में हर अच्छी और स्थायी चीज मेरे कारण है। हालांकि ये शब्द सरल हैं, वे दिल से पीड़ित हैं। यीशु के नाम में, धन्यवाद! Lord of majesty and mercy, every good and enduring thing in my life I have because of you. While these words are simple, they are heartfelt. In Jesus' name, thank you!